That's not dirt on his side. 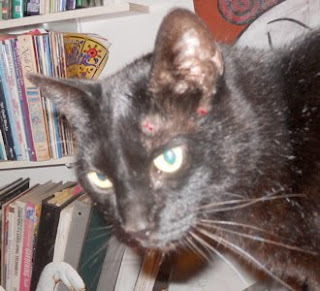 He has about three feathers there that are tipped in black. By the way, he has feathers as soft as my Black Australorp Eartha -- perhaps she's his mother! 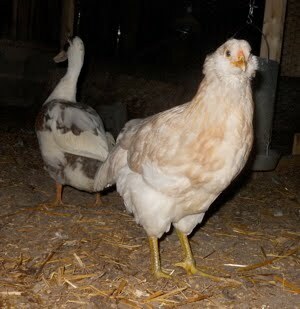 Elsewhere in the barn, this apricot girl is one of the Easter Eggers I bought this spring. Notice her bluish legs and Amish beard! 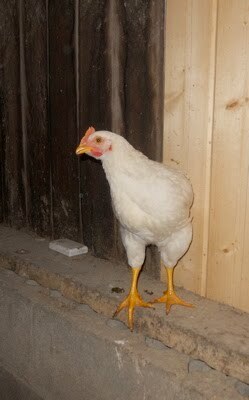 I can't wait to see what color eggs she lays. 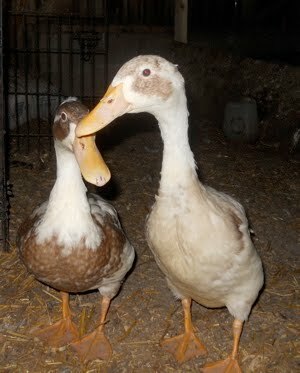 I'm starting to refer to these two as "The Wacky Quackies"! They talk more and more. And look how tall they are! 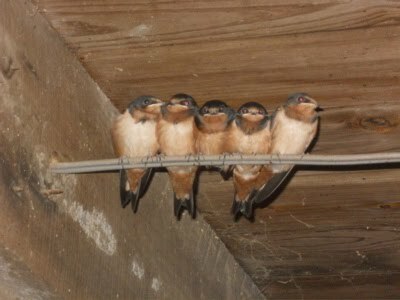 -- that's right -- all FIVE perching together! 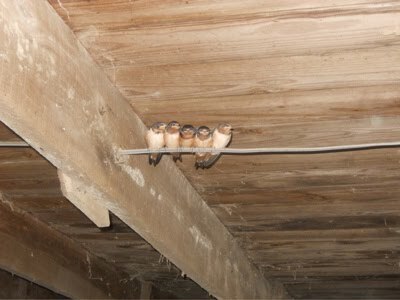 The nest is on the other side of that beam. No way can they all fit in it any more. Look at their beautiful reddish bellies, and their beaks all lined up. They remind me of gangsters, all huddled around plotting their next heist. All they need is a cigar and one of those gangster hats! 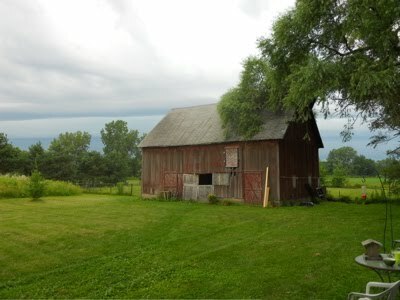 Hope they don't blow up the barn! Heavy, heavy hangs over my head! 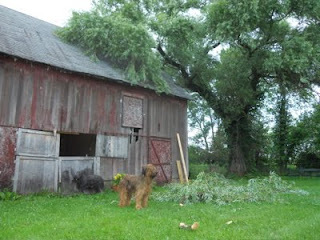 This huge branch hangs over my barn, and with each big storm I fear coming outside to discover it's cracked. Not this time! Some big willow branches did come down, however. 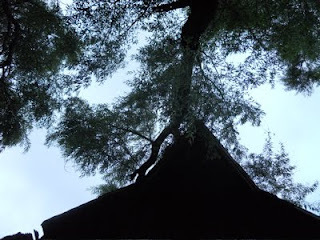 It's a magnificent old tree, look how huge the trunk is (below). But willow branches are notoriously weak. Any big wind and snap snap snap! 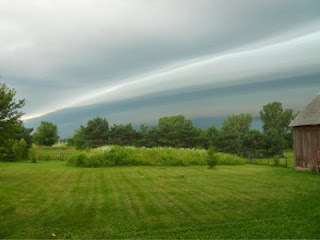 Last night once again we were visited with a 80 mph sustained gust. That's hurricane force. The storm scared the pets. Oskar cuddled with me on the couch, and I got to do a good deal of brushing on him in preparation for his surgery today. But we'd all rather have skipped it! 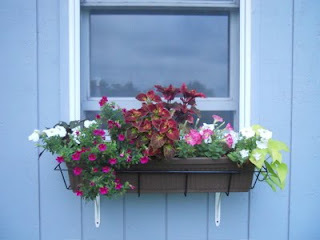 When will things dry up so that my vegetable garden can grow as lush as the window boxes?! We are delighted to be included in Dobbies Garden Center's list of chicken keeping blogs! It's a great list, I've visited most of them myself, but I want to put it out there in case you have not seen them. For the past week, one of the Ameraucana hens has been punky. Her feathers look as if she's moulting, she's avoided crowd scenes. In the barn this happens from time to time. 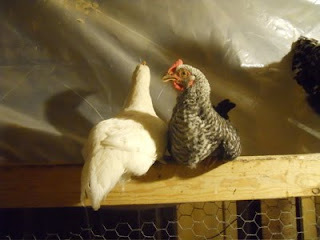 My oldest chickens are now four years old. 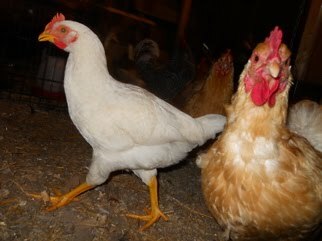 While a chicken lifespan is reported to be 10 years, I don't know many people whose flocks make it that long. Predators get them, pests get them, age takes its toll. 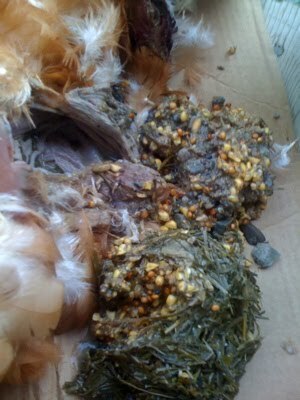 A hen might be a little off one day and dead the next; a hen might withdraw for a few days and rally back to good health. Yesterday morning I heard a cry from behind me as I scattered scratch. 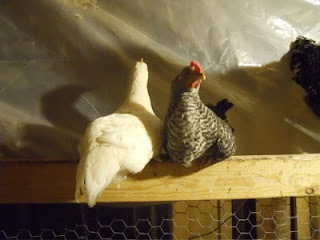 Upon turning around I discovered the punky hen with the young rooster on top of her, as she cried for help. I pushed him off and she lay there with one wing outstretched. Pitiful. 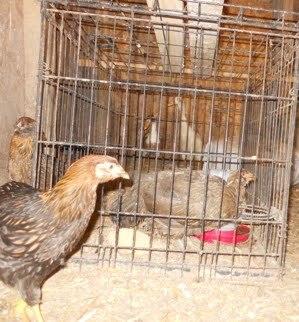 So I picked her up and set her in the dog kennel where she can be protected from other chickens. Set her up with her own food and water, and expected to come back in an hour and discover her dead. But when I returned mid morning, she was sitting upright, a bit perkier than I've seen her. And this morning she seems to be gaining strength. Will the rally last? Can't say, but I am encouraged that I was able to give her comfort in her difficult time. 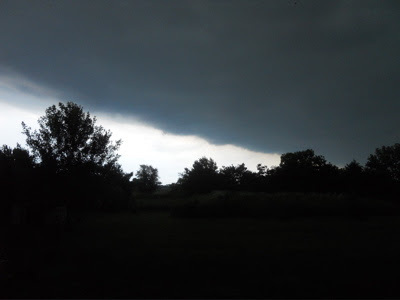 Then it began to pour. Which effectively ended my gardening day. Once again. Hope I can get more things in the ground before July or I'll never have a harvest! 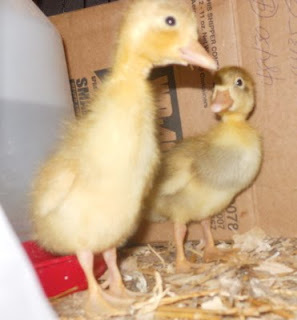 These two birds hatched April 11. Remember? Yup, that was them, with Godzilla Hen. I've been hoping so eagerly that they are girls. Two roosters (Egglebert and Eggy Jr.) are plenty in this barn. We have no need of additional testosterone. I am partial to the white one. 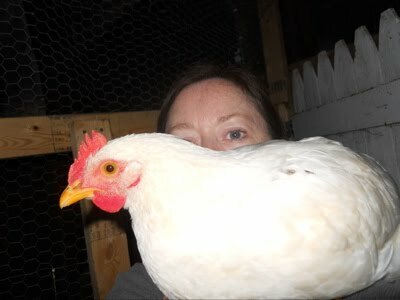 No other chickens in the coop look like that. This morning when I scattered the scratch, she was so excited she jumped up on my shoulder and shimmied down my arm to reach the source of the delicious treat! Then when my palm was empty, she nestled her belly into my hand to relax for a bit. 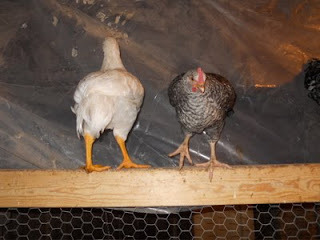 I'm having trouble believing that these long legs are on a pullet. More and more, this chick's structure reads "male" to me. They are eight weeks old now, and that's when I can start to distinguish. I've been wrong before. I really wish I was wrong here! Maybe someone more experienced will chip in their two cents on this! Or vote in our new poll! What will this chick become? 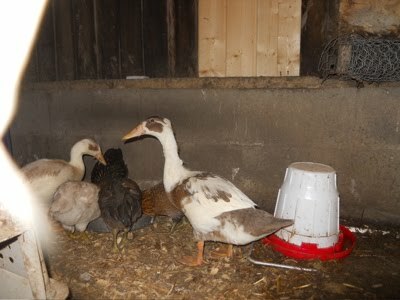 As far as the other young'uns go, I think the Runner Ducks are looking great! 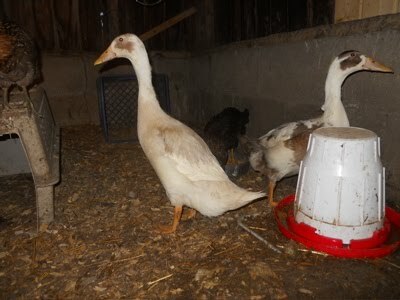 Sometimes they stood upright, and sometimes they were more in your traditional duck pose, like the one in the background. But they turned out to be the real deal. They're kind of skittish, but very curious about everything! They still whistle and again, I do not know whether they are boys or girls. Look at those chocolate markings -- really lovely! I can't wait for them to go outside and swim! So life in the barn is good here at the two month mark. A word game after my own heart! You can hear about it here at A Way with Words. The show is an hour long, but this part is right at the beginning. 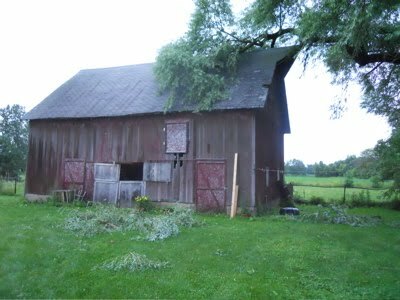 And if you're wondering what this is doing on the Busy Solitude Farm blog, read the title again, pronouncing it letter by letter! Nearly the same photo. The flash clicked on the second one. 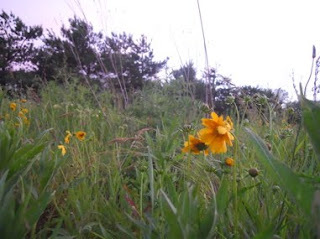 I like the way the coreopsis in the first photo seems to be opening itself to the sky. Reaching up for...more rays? Everyone knows that the flowers are appearing early this year. This field of gold magically emerged in the past week. 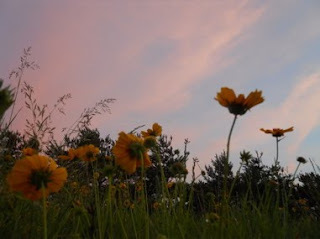 It's spectacular at dawn and dusk, when the low sun rays catch the petals without brightening the sky. 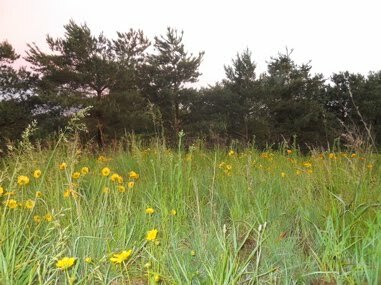 Normally the coreopsis last weeks; this season your guess is as good as mine! The long view, from the flowers, across the chain link fence to the "back yard" and beyond into the crop field, ending at the heron's creek. And guess what? These flowers are atop my septic mound! 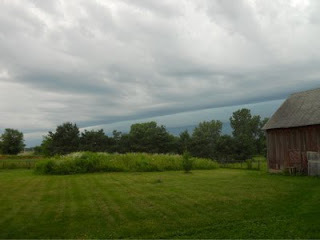 When I discovered I'd have to have a raised bed, I did some research and saw that many county extensions recommend planting prairie plants on septic mounds in order to reduce erosion and to use up the moisture there. So I contacted J.F. New and ordered a sack of low grasses and forbs (the flowers). Now it's a delight! 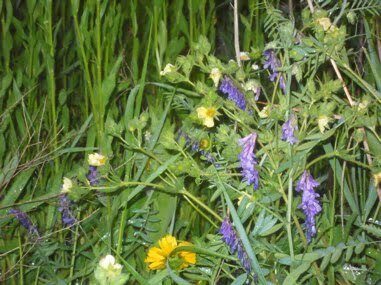 I even enjoy some of the weeds that have offered themselves up, though I try to eliminate most of them. 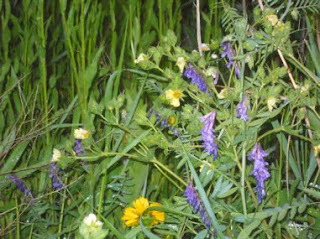 This purple flower is cow vetch, a pea relative. I absolutely love it, although it is a weed. I always keep it! 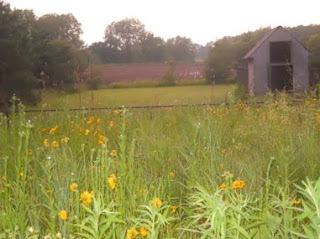 Don't you agree that my field of gold is better than a plain, green septic field? 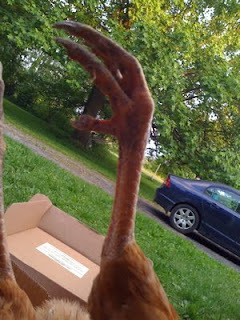 SAM: We laid the chicken out on its back with its legs sticking straight up. 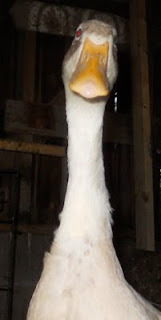 Of course, my sister Ellie had to get a picture of the irresistible feet. ELLIE: So here we go. 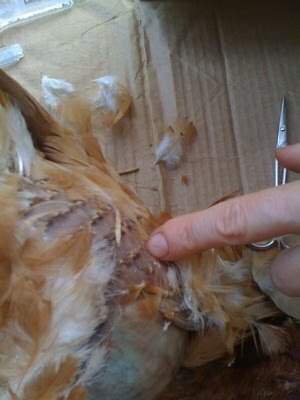 Razor sharp scalpel glinting viciously, raised a hair’s breadth or should I say feather’s breadth above the chicken’s throat. I really don’t like beginnings. They’re hard, and ultimately, are scary. Well, here it’s gruesome/scary and I have a queasy feeling in my stomach at this suspenseful moment. Snap! Moment’s gone, scalpel is slicing through the soft, thin skin with an unpleasant sound. But no blood flows out because the chicken’s already dead and has been for 2 days. Kinda gotcha there, didn’t I? Well, back to business…. BETH: The crop was obviously huge -- it was amazing the amount of food that was being stored in there. 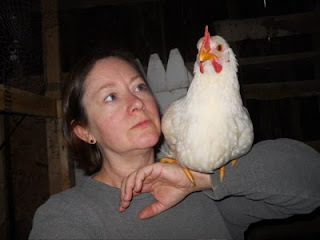 If I had been thinking correctly, I would have dissected another chicken that had just died from our flock to compare them, but I was tired and only later thought of it. At any rate, there was something odd about the crop. I immediately noticed that the muscle tone was not good. I dissected other parts of her and found nice, pink "bouncy" muscle tone, even after she had been dead for a couple of days. The crop was not that way at all. The insides of the crop were grayish with white splotches on it -- kind of like the coating on my tongue (whitish, prickly, and pasty) when I'm sick. 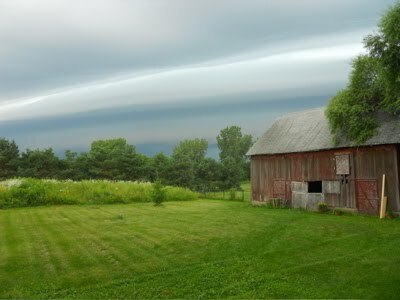 So you're probably asking, What the heck is a crop? 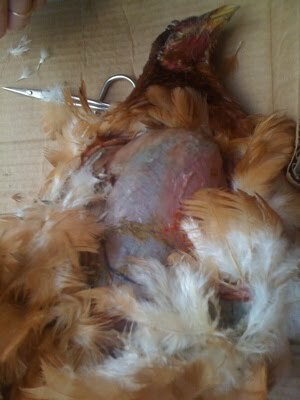 Well, for a chicken it's pretty essential as all body parts are and is a storage place for the chicken's meals. This crop was evidently huge and bulbous, the size of a softball which I assure you is not normal. A healthy crop, when full, should be the size of a normal 9 year old's fist. The crop is supposed to be sort of a broadening of the esophagus -- her's was way out of line. It had stretched so much that the pressure of it was making her lose her feathers in that area. The skin there could not be separated from the crop lining -- they sort of melted into one. We cut the skin away from around it then slit the film that holds everything in. You see three meals all lined up. On the bottom, the oldest I mean, there is a ton of long, stringy grass and green fibers. On top of that, kernels of corn and seed. The top is nothing that falls into the food category and is very surprising, if a bit horrifying. This was her last and most recent meal before her death – grit, pebbles, and stones. Not little stones, but big rocks. Rocks that should never have gone down her throat, they were so large. She even swallowed a piece of sharp flint that could’ve cut her throat. Some of these rocks were big! Seriously big!! I think she was feeling a bit desperate to get things moving. After emptying the contents of the crop, I explored a little further into the digestive tract. The proventriculus comes just after the crop and is sort of the first real stomach. Although I'm no chicken anatomy expert, there was something wrong here. There should have been more of a narrowing of the tissue after the crop at the proventriculus, but there wasn't. The tissue seemed limp and lax. The muscle tone being that way may have meant that she couldn't easily push food through from the crop as is normal. To complicate matters, when food becomes compacted in the crop (which does happen occasionally) bacteria and fungus can begin to grow which is what I think was happening. The color was not pink like surrounding tissue, but was dull and ruddy, grayish/whitish. And I'm told the smell was quite horrific, tho that kind of thing doesn't really affect me much. Sam, my sensitive nosed boy, couldn't stop saying, "Oh -- OHHH. That smell. OHHHH." He plugged his nose incessantly and wondered how I couldn't smell it. I think the food was really beginning to rot in there. As the three of us leaned over all this and examined the contents, the smells wafted up to my brother Sam’s nose. These smells hit him like a punch and he fell backward, making distressed sounds and plugging his nose. It smelled like very rotten cheddar cheese. I was not affected by any of this because my nose was born for dissecting and is always stuffed up. Lastly, she was emaciated. Very thin. Since this had been going on since birth off and on, I think it probably took its toll on her ultimately. Upon further research, I learned that it is indeed the case with pendulous crop problems that the misshapen, lax muscle cannot move food along. 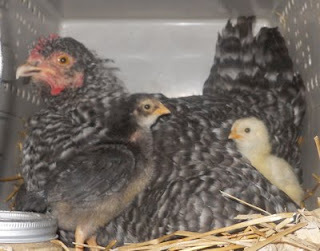 This problem starts as a chick and there doesn't seem to be consensus on what causes this to happen – genetics or too much heat -- who knows? I'm sure she had as good a life as she could have had, though. You're such a conscientious, caring person. If I was a chicken, I'd want YOU for an owner!